Given the volume of games that hit iOS and Android every day, it takes something special to stand out amongst the crowd. At first glance, Relic Run looks like little more than a Temple Run knock off, a cynical attempt to cash in on the popular auto-runner genre. That is doing Simutronics a massive disservice though, because Relic Run is far more than a re-skinned Temple Run, with some genuinely interesting gameplay innovations. At first, things are exactly as you would expect. Lara sets off at a run through some jungle ruins with you swiping left and right to switch her between the three lanes, and up and down to jump or crouch to avoid obstacles in your path. As you go you’ll collect coins that boost your score and can be spent later on upgrades, as well as clues. Collect enough of the latter in a single run and a relic will appear, 15 of which will unlock the next stage. Fairly standard for an endless runner then, but then you come across a more cinematic moment. These can come in the middle of normal actions, Lara vaulting a fallen pillar say, with time slowing slightly and the camera panning around in a sweeping shot, or in longer segments, with Lara jumping off a cliff, swinging between trees then dropping to the ground as you regain control. Early on in development these were apparently QTEs, but were dropped in favour of giving players a short break – a smart move. Another break from the template are the vehicle sections. A short cinematic again sees Lara jump onto an ATV or a motorbike before handing control back to you. With the same controls as when on foot, these sections are a little faster, but the change of pace and scenery is a nice one. These departures from the norm – while interesting – still stick roughly to expectations for an auto-runner, albeit a slick one. Simutronics, however, has also incorporated touch-screen combat sections. 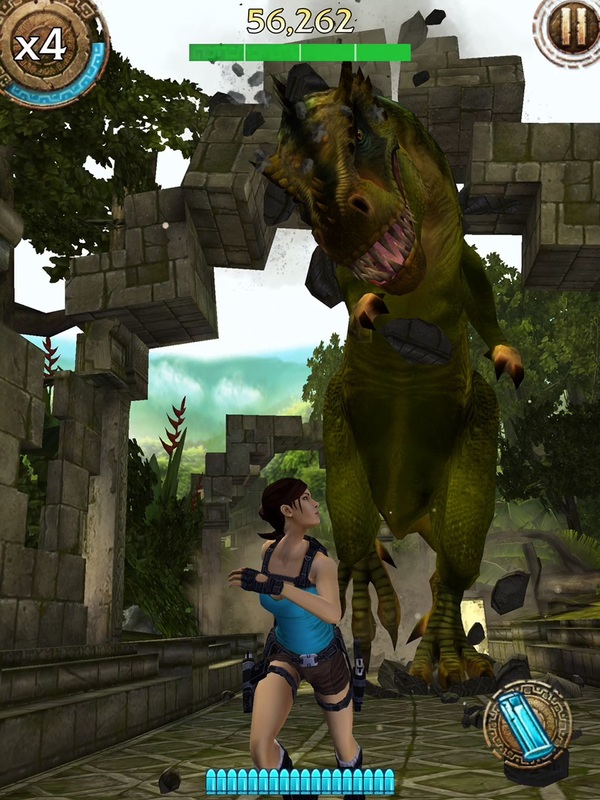 These see Lara whip out her trademark dual pistols and shoot monsters that appear at the side of the screen. Thoroughly on rails, you’re left to tap on the respective baddie you want to shoot, taking them out before they can throw anything at you. It can be a little imprecise, but it’s an interesting mechanic. Get far enough into a level meanwhile and a boss will appear in the same form of on-rails combat, with the first level pitting you against a T-Rex. In an interesting twist you’ll only be able to damage it if you have upgraded weapons, meaning encounters will play out differently; if you’re not upgraded you’ll simply escape after a certain amount of time. There’s a freshness to Relic Run in how it changes pace and how seamlessly the different elements have been combined. Obviously there’s the standard leaderboards, which keep track of scores across all platforms, as well as Facebook integration. The latter is interesting however, as it lets you send Curses to your friends, turning their screen 8-bit or giving it VHS flicker for 30 seconds. If they die during that time you get a reward, if they survive they do, as well as the chance to return the Curse. Gameplay-wise there’s only one major misstep. Certain obstacles can be passed by wall-running; swiping and holding either left of right until you’re past the blockage. Technically it works fine, but it isn’t always obvious if a hole can be jumped or if a wall-run is needed, with the waters muddied further by the occasional chasm that can be crossed both ways. It’s important to remember that Relic Run is a free-to-play mobile title as well, because that of course means it’s rammed full of microtransactions. Credit to Simutronics that they’re not as obtrusive as they could perhaps have been, with almost everything available through standard play, but it will take you upwards of two hours to unlock the second area through normal play. With health items, new costumes and the like available to pay for, my only real concern is the top tier of weapon unlocks which can only be bought with real money, particularly when the game asks if you’d like to buy the Super Weapons Pack for a princely sum. You’ll need to watch what you play it on as well. For the review, I tested Relic Run on an iPad, an iPad Mini and an iPhone 5s and on the latter the screen was far too small for the – already imprecise – combat sections, and only on the full size iPad was it truly comfortable. 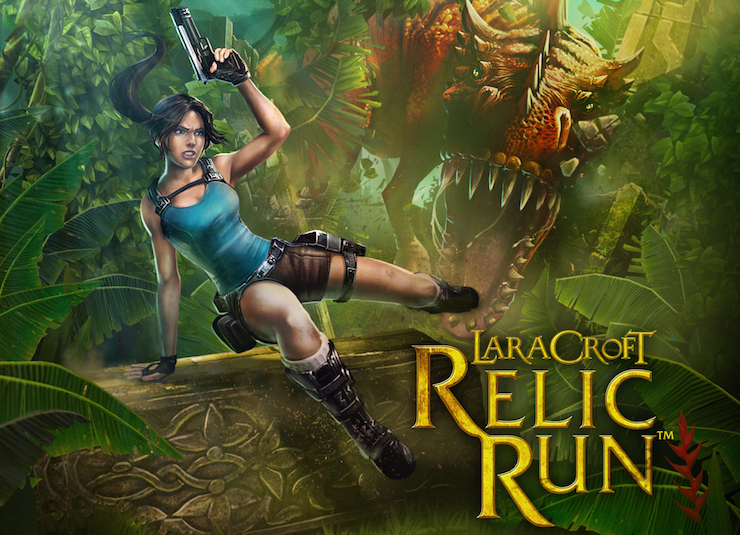 Overall though it’s hard not to like Lara Croft: Relic Run. Far more than a re-skin of a popular genre, Simutronics have worked hard to make a Triple-A auto-runner and they’ve succeeded, with plenty of innovation held together with cinematic shine. Review based on time spent at a Square Enix event. More than a Temple Run clone. Tricky on a small screen. An innovative auto-runner with a AAA shine.